High-resolution x86 Android. An FHD resolution and the still uncommon for Android x86 processor lets the Memo Pad FHD stick out of the crowd. But how will the device fare when examined closely? The Asus Memo Pad FHD 10 is launched on the market with unusual technical specs: An Atom processor rather than an ARM computing core is still rare. However, considering the tablet's price of approximately 350 Euros (~$468), Asus' FHD 10 will have to compete against high-profile contenders. 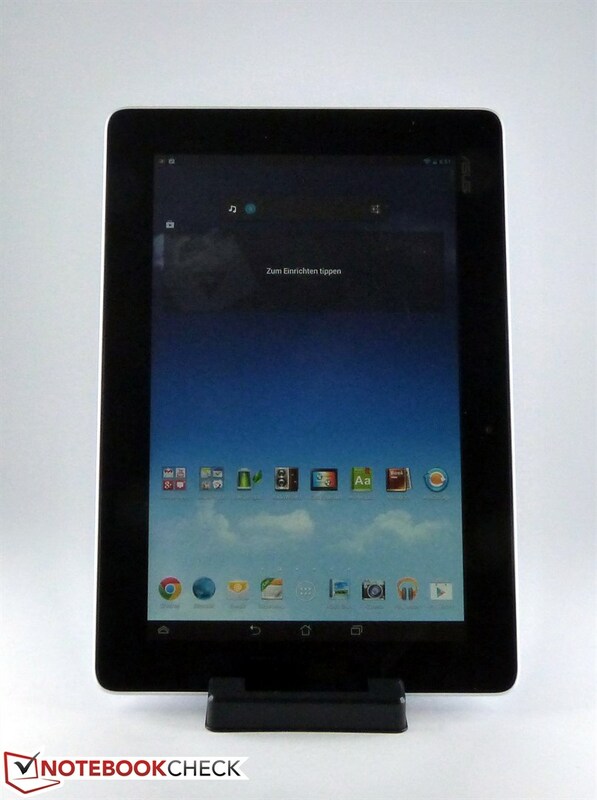 For example, Google's Nexus 10 with an even higher-resolution screen is only marginally more expensive. Asus does not debase its own Transformer Infinity since the FHD 10 does not come with a keyboard dock. Its price of 499 Euros (~$668) is also quite a bit higher than that of the FHD 10. Nevertheless, Asus will have to compete with the new Nexus 7 since the Nexus made by Asus also features an equally high-resolution screen. Only the price for Google's device is considerably lower than of the FHD 10 although its tech specs sound better, at least on paper. A dual-core Atom (Z2560, 1.6 gigahertz) clocks inside the Memo Pad FHD 10. At least four computing cores are displayed although only two are present owing to Hyperthreading. The working memory of 2 GB is up-to-date. In return, the averagely fast SGX544MP2 with 400 megahertz takes care of the graphics. The storage capacity of our review sample courtesy of Asus is 32 gigabytes. Not quite 25 gigabytes of that are usable. Asus also offers a 16-gigabyte model. Android 4.2.2 "Jelly Bean" is installed as the operating system. There is no indication that an update to the latest Android version is planned to-date. Asus will not use an Intel CPU for its upcoming LTE FHD 10 version. It will be powered by a Snapdragon S4+ from Qualcomm. Consequently, the test results of this model cannot be transferred to the LTE version. The FHD 10's upper side looks elegant and high-quality. 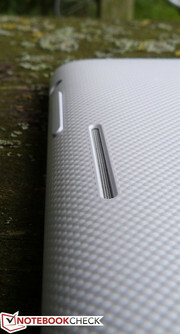 Although Asus relies on plastic for the casing, the Memo Pad FHD 10 makes a high-end impression. The ribbed back is very pleasant. 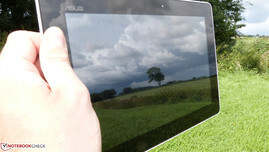 The tablet can be held securely and does not slide even in summer-moist hands. The weight of 571 grams (~1.26 pounds) is quite decent for a 10-inch tablet. Contenders like the Nexus 10 (603 grams/~1.33 pounds) or the latest Apple iPad (652 grams/~1.44 pounds) are heavier. However, the tablet's bezel is very wide and thus the FHD 10 is not a slim tablet that can be slipped into a pocket. Its size of 264 x 183 x 9.5 mm (~10.4 x 7.2 x 0.4 inches) makes it impossible to reach the screen's center with the thumbs when held in both hands in landscape mode. Although this is inconvenient, it is no different with many other 10-inch tablets with a 16:10 resolution. The casing's build is satisfactory but the screen creaks very audibly when twisted. Like many tablets, the FHD 10's battery is non-removable and cannot be exchanged. Asus installs Intel's Atom Z2560 in its FHD 10, which is still uncommon in the Android sector. It is a dual-core processor with a clock rate of 1.6 gigahertz. Intel incorporates its proprietary Hyperthreading technology to increase the performance and capacity. The operating system displays four rather than two computing cores and the performance is slightly higher than without the HT function. Since the Z2560 is based on x86 innards and not ARM technology, the use of this CPU requires specialized applications. 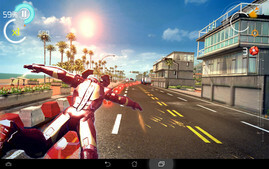 Unlike the first Atom tablets and smartphones, most Android apps are now available in a compatible version in the store. We could install almost all apps necessary for our exhaustive random tests. 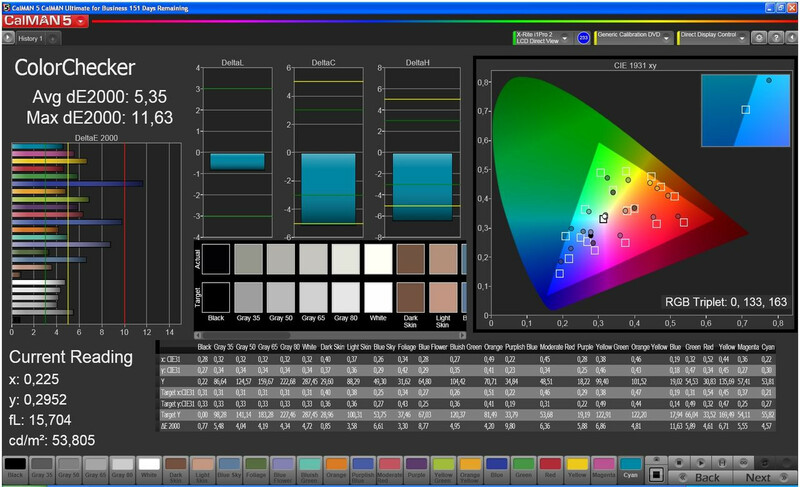 The SoC-integrated SGX544MP2 is responsible for graphics. This PowerVR-licensed graphics unit does not exactly excel with breathtaking performance. Asus was generous with the memory and installs a total of 2 GB DDR3 memory. The storage capacity is either 16 or 32 gigabytes depending on the model. Almost 25 gigabytes of the 32 gigabytes were still unused in the review sample at hand. The storage can be expanded by up to 32 gigabytes via a micro-SD card. The only other interfaces are the micro-USB for recharging the battery and connecting the tablet to the PC and the micro-HDMI as well as the 3.5 mm headset jack. The ports are placed quite spaciously and do not impair each other. Only a few modifications have been made to Android. Like in its Fonepad and Memo Pad HD 7, Asus relies on a restrained yet reasonable extension of Android. Version 4.2.2 "Jelly Bean" is installed. 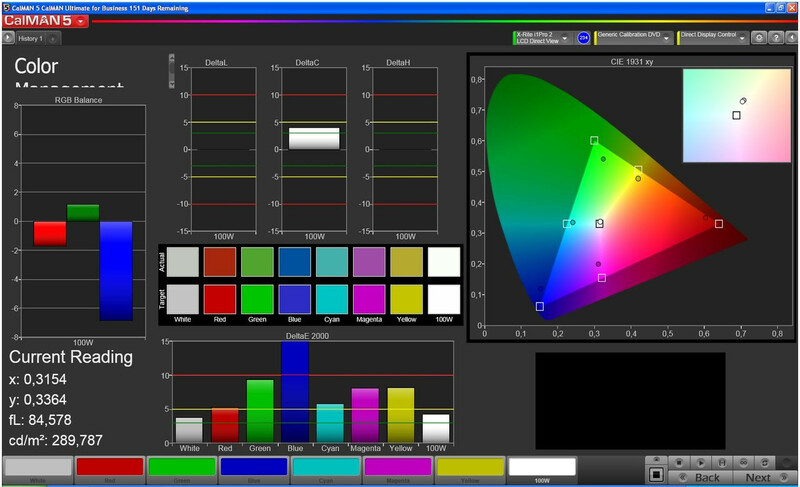 Asus adds the one or other widget and expands the system with a few proprietary apps and a tool for calibrating colors as well as a basic equalizer. Asus also offers the buyer 5 gigabytes of storage in its own Cloud service. 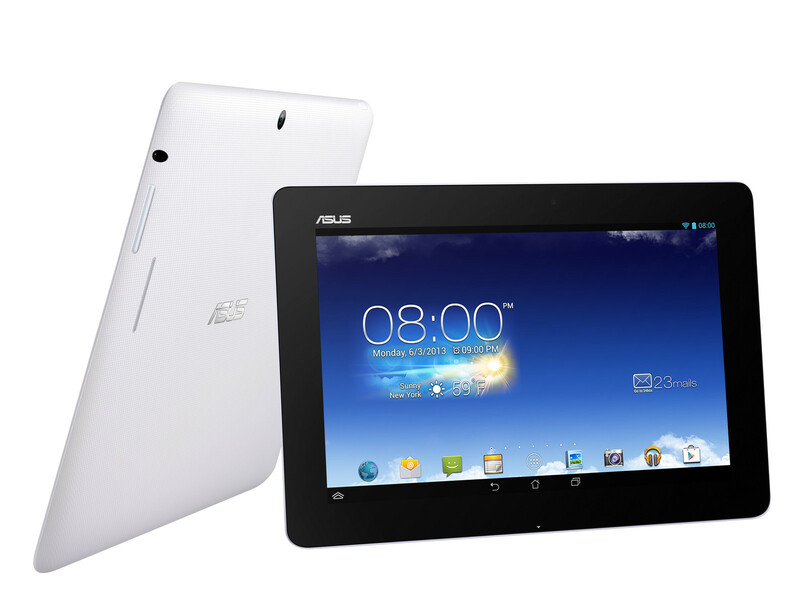 Asus' Memo Pad FHD 10 supports Wi-Fi 802.11 b/g/n with a maximum of 150 megabits per second. 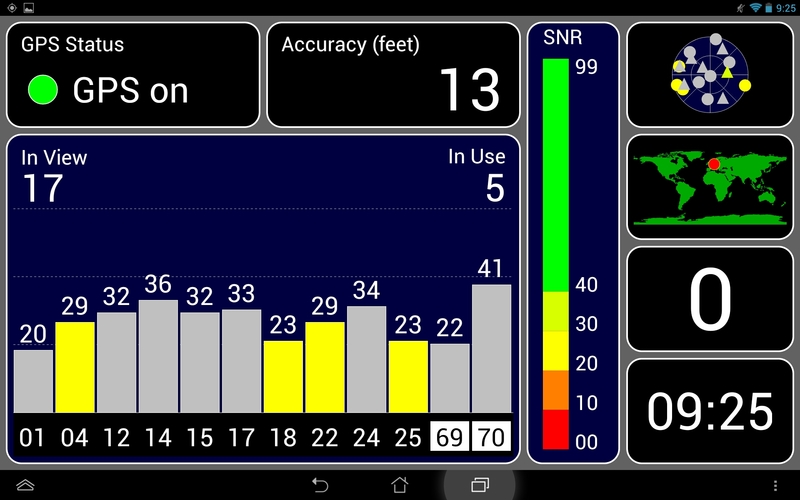 The range using a Fritzbox LTE was compelling even over several stories. It was possible to stream a Full HD video smoothly from a network hard drive over 20 meters away (~66 feet, beeline without obstacles). Our review sample does not feature UMTS/LTE but a corresponding model can be pre-ordered. The tablet supports Bluetooth 3.0. It can be connected to a TV without cables via Miracast/Wi-Fi Direct. In addition to GPS, an e-compass is also available. It worked well in a quick test. The GPS localization took quite long with up to 30 seconds and the result is rather middling. Localization took even longer indoors and did not present usable results. The Memo Pad FHD 10 features two cameras. The rear-facing model has a resolution of 5 megapixels and only produces appealing results in good daylight. The quality is sufficient for snapshots but the sense of using a 10-inch tablet for shooting pictures is not really apparent from the outset. The camera records video in Full HD with average quality. The front-facing camera has a resolution of 1280x800 pixels. 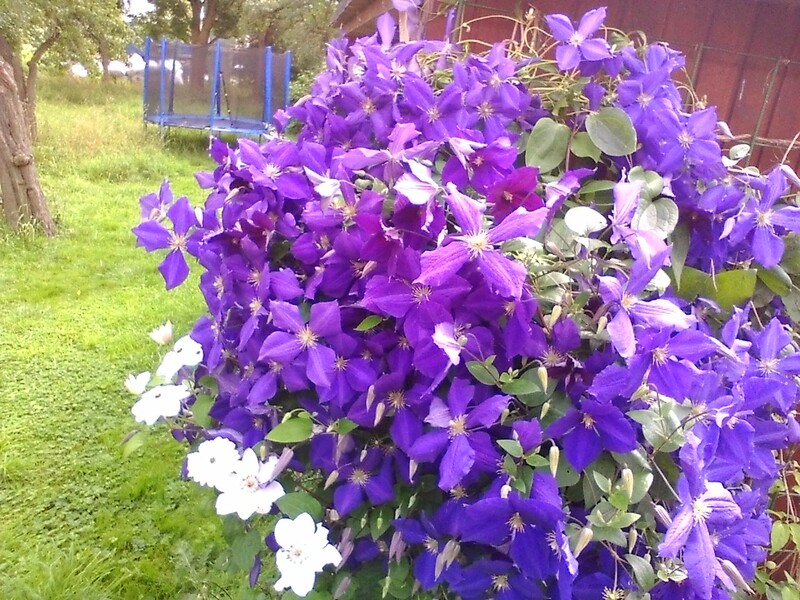 Pictures taken with this camera are not suitable for the album, but rather for forum avatars in mini-resolution. However, the available quality is apt for video calls. After taking out the tablet from its functional box, we noticed that Asus does not include more accessories for its more expensive Memo Pads than for its less expensive models, such as the Memo Pad HD 7. In addition to the tablet and a manual, only a 2A power supply with USB-out alongside its micro-USB cord is found. The plastic stand we praised in the HD 7 only appears after shaking the box energetically. The stand is a low-cost, thin plastic, disguised as packaging material with which the tablet can be propped up. Although it seemed to be a courteous accessory in the Memo Pad 7, it looks stingy in view of the FHD 10's high price. This seems even truer considering that the small stand has difficulty keeping the larger tablet upright in portrait mode and makes the impression that it would fall over if nudged. Asus includes a 24-month international warranty including pick-up & return on its Memo Pad FHD 10. 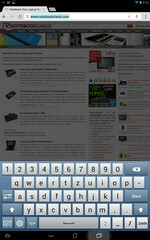 Asus installs its own virtual keyboard on all new devices. This is good because although Asus' virtual keyboard is actually only solid standard fare and does not feature any convenient Swype functions, we like the key layout. Particularly the number row above the sufficiently sized letters could be a part of every new Android device. Especially in a time of the securest possible passwords that should include numbers. 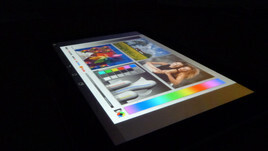 The touchscreen itself supports 10-point multi-touch and was actually able to cope reliably with 10 fingers at the same time during the test. The fingers glide easily over the screen. In return, the automatic rotation is a bit sluggish. Asus places the few physical keys quite far apart; there is enough room for that. Thus, users will not mix up the volume button with the power button and turn off the tablet unintentionally. However, the power button is confusing. It was sometimes very responsive and shut down the tablet although it had not been pressed properly. Intel's processor presents a speedy work speed but scrolling or swapping between the Android screens was occasionally jerky. This was particularly the case when apps were being uploaded in the background on the Memo Pad 10. The screen in the Memo Pad FHD 10 has an agreeably high resolution of 1920x1200 pixels. Although the pixel density of 240 dpi is lower than in the Retina iPad or Google's Nexus 10, single pixels are not visible even when holding the tablet very close to the eyes. The aforementioned contenders, Asus Iconia Tab A700 and Asus Transformer Infinity as well as Huawei MediaPad 10 FHD also feature a resolution of 1920x1200 and thus have the same pixel density because their screens have a diagonal of 10.1 inches. The tablet pleases with a decent black value and pleasing contrasts in dark movie or game scenes. As so often, the screen is high-gloss and causes intense reflection in direct sunlight. The screen's brightness (294 cd/m² in the center) can defy reflections in partial shade. 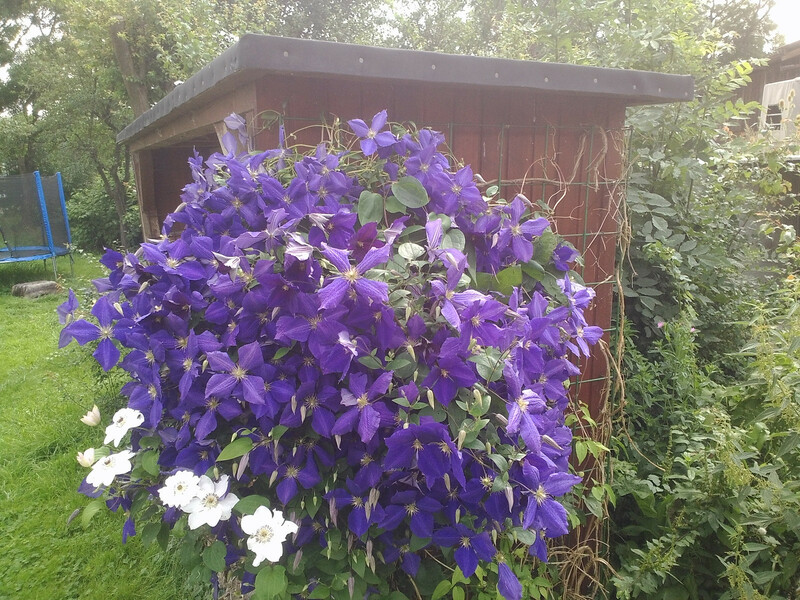 The picture is displayed without distracting reflections in a bit of shade. 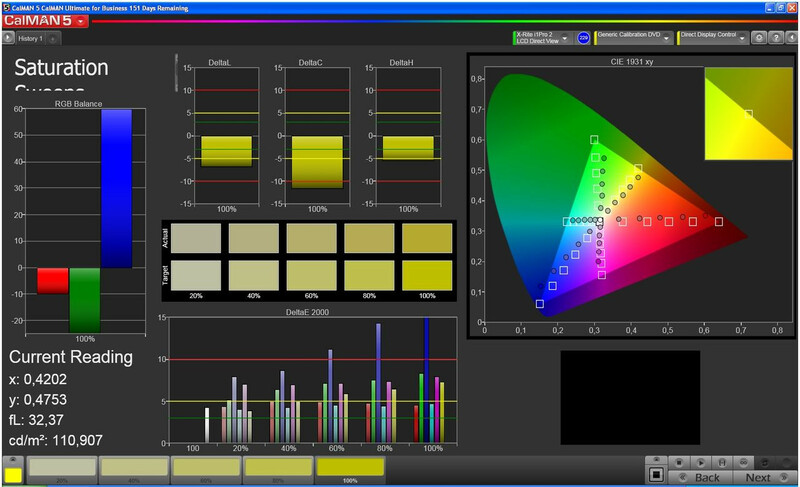 The FHD 10 does not exhibit bleeding or other illumination-related catastrophes. The ascertained black value of 0.2 cd/m² will be noticed via agreeably dark movie scenes in routine use. The sufficient brightness of 294 cd/m² also delivers an advantageously bright picture and even outshines many reflections. The IPS screen's contrast is 1470:1 and thus the screen in Asus' Memo Pad FHD 10 can compete with more expensive devices. Despite its glossy screen, the Memo Pad 10 FHD can be used outdoors. However, direct sunlight should be avoided. Due to the good brightness of 294 cd/m², the tablet delivers pleasing pictures by turning away from the sunlight just slightly. The viewing angles are almost always good no matter the orientation due to the IPS display. Thus, nothing stands in the way of easily sharing the tablet with nearby friends or family. The overall bundle is good: Intel's Atom Z2560 calculates fast and the GPU's power is sufficient for the high-resolution screen. However, games stutter occasionally and the PowerVR graphics unit is not exceptionally future-proof. On the other hand, the 2-gigabyte working memory ensures that apps open quickly and only minor stutters occur when using Android. Not quite 26 gigabytes of the 32 gigabytes in our review sample are available. Consequently, many users might have to use the SD slot sooner than they think. Asus does not include luxury configuration items, such as a digitizer or IR sensor for using the tablet as a remote like Sony's Xperia Tablet Z, in favor of the price. LTE is optionally available in models that are more expensive. Asus' FHD 10 is suitable for use as a reader for books or comics and rendering videos and pictures due to its high resolution. Either Intel did not dare to design the Atom Z2560's graphics unit faster or it had a limited Watt-budget. Nevertheless, the integrated PowerVR SGX544 proves to be quite strong particularly considering the high resolution. The current Nexus 7 is almost always on a par but provides a much better score in the Epic Citadel benchmark in ultra-high details. Acer's Iconia Tab A700, also with a Full HD resolution, is defeated. The Internet performance of Intel's chip is amazing. The Sunspider browser benchmark recorded very impressive speeds on the Memo Pad FHD 10. 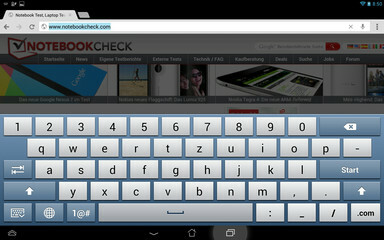 However, Google's Nexus 7 proved to be stronger in Browsermark. In return, the MediaPad 10 FHD fell behind. The storage device's performance proved to be on a good level. Although the FHD 10 did not achieve the speeds of the Nexus 10, it absolutely debased Acer's A700 Full HD tablet. The PowerVR SGX544MP2 integrated in the Atom Z2560 renders graphics with a clock rate of 400 MHz. The GPU can deal with the 1920x1200 pixel screen in everyday use. However, a few games with high graphics demands stutter a bit. 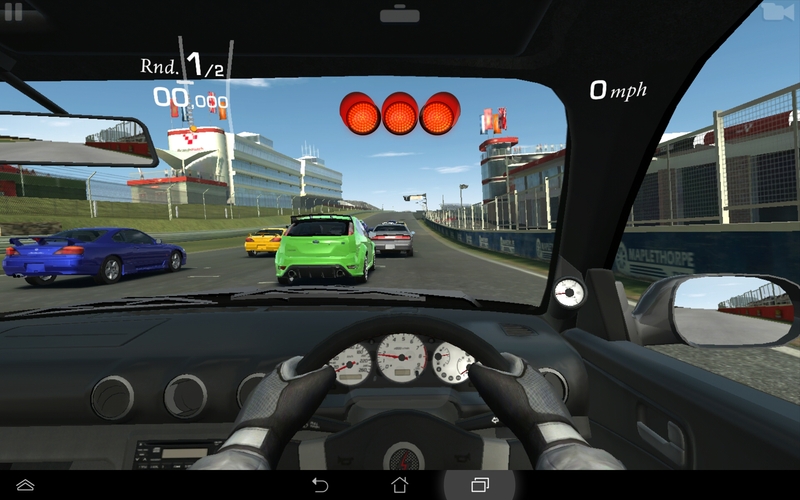 Thus, winning a race in Real Racing 3 was rarely possible without stutters. Iron Man does not seem to get along with the x86 CPU. The game stuttered considerably more than the installed graphics solution would let us assume. The pretty graphics of the Unreal Engine, in the form of the Epic Citadel benchmark in our case, ran smoothly even in the high WUXGA resolution. Asus' Memo Pad FHD 10 definitely does not suffer under excessive temperatures. The idle rates are just above room temperature and they barely increase during load. The tablet can be placed comfortably on the lap owing to a maximum of 32 degrees Celsius (89.6 Fahrenheit) and the pleasantly ribbed back. Intel apparently has the Atom's power consumption under control very well. The CPU's cooling system proved to be more than sufficient even in the multi-hour stress test. Both stereo speakers in Asus' Memo Pad FHD 10 produce a good sound for this device category. The stereo experience is very noticeable and the bass even vibrates a bit on the fingers in games. The sound can also be adapted to every situation via the equalizer app. 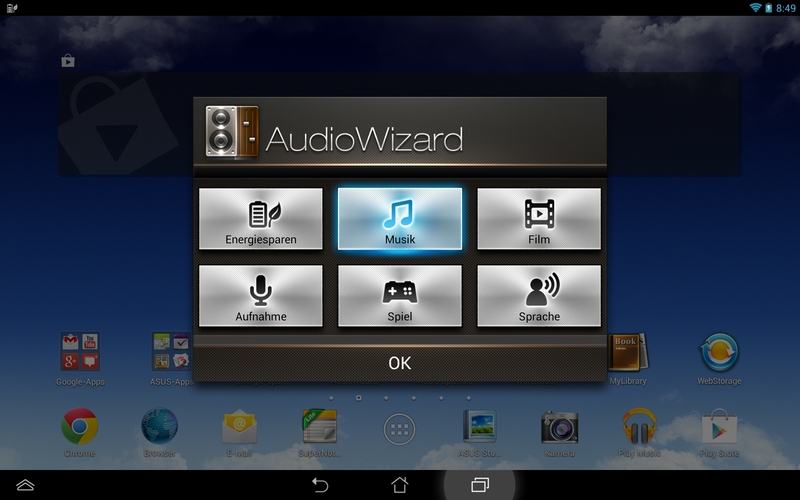 Although the FHD 10 is not suitable as a stereo system, other tablets have the same problems. The high-resolution screen takes its toll on the power consumption. 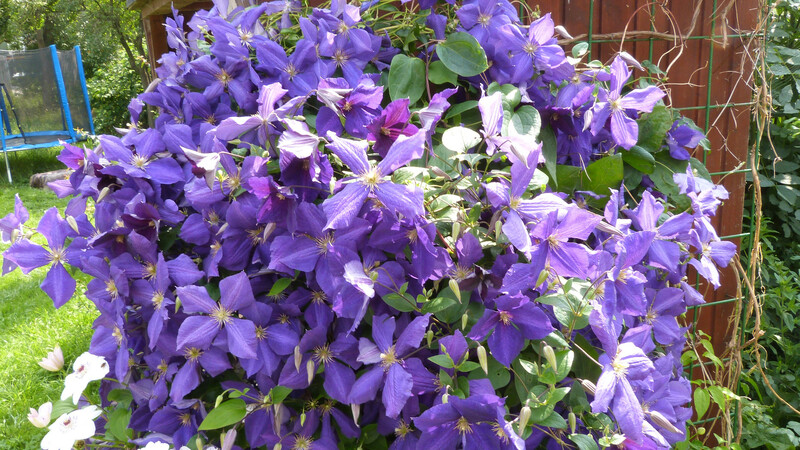 High resolutions have to compensate with high background light to achieve a sufficiently bright picture. Consequently, above-average consumption is always seen when the screen is run in maximum brightness. The tablet only consumed 2.8 Watts in idle using minimum brightness. It was 6 Watts in maximum brightness and 6.8 Watts in high-performance and enabled Wi-Fi. The consumption only climbed marginally to 8.4 Watts when the SoC was loaded by a stability benchmark and the Wattmeter recorded 10.2 Watts when the GPU was added. The FHD 10 is not convincing in standby. The FHD 10 consumes a bit more energy on standby than expected for a tablet at a measured one Watt. The battery in the Memo Pad FHD 10 is not too small with 6760 mAh. And in fact, the tablet's battery runtimes are compelling. It lasted for over 5 hours during load and over 7 hours in the Wi-Fi test. Quite good rates for a WUXGA tablet featuring decent screen brightness and convincing performance. However, the tablet's idle runtime did not fulfill our expectations. Huawei's MediaPad 10 FHD offers a bit more time than the Memo Pad FHD 10 for Wi-Fi browsing. However, Asus' tablet does not come close to the very good runtimes of the iPad 4, apart from the somewhat better load runtime. 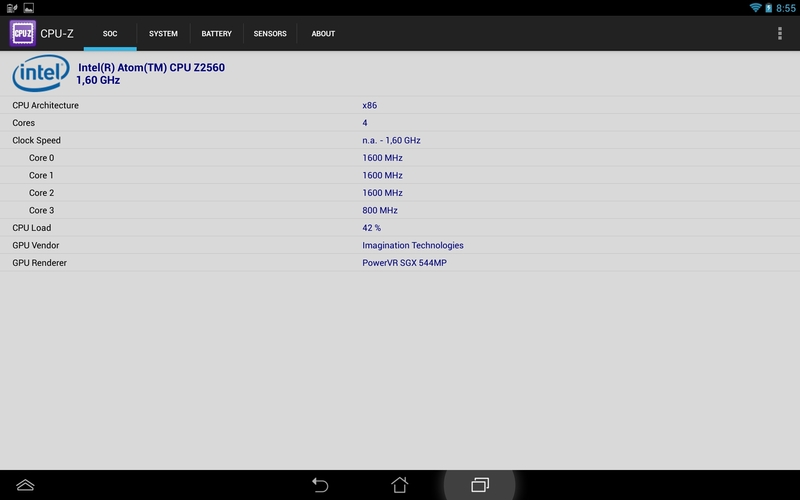 The energy hunger of the A15 core in Google's Nexus 10 is seen in load. The Asus can be used for two hours more without the mains here. However, the Nexus 10 lasted for over 10 hours in the Wi-Fi test. 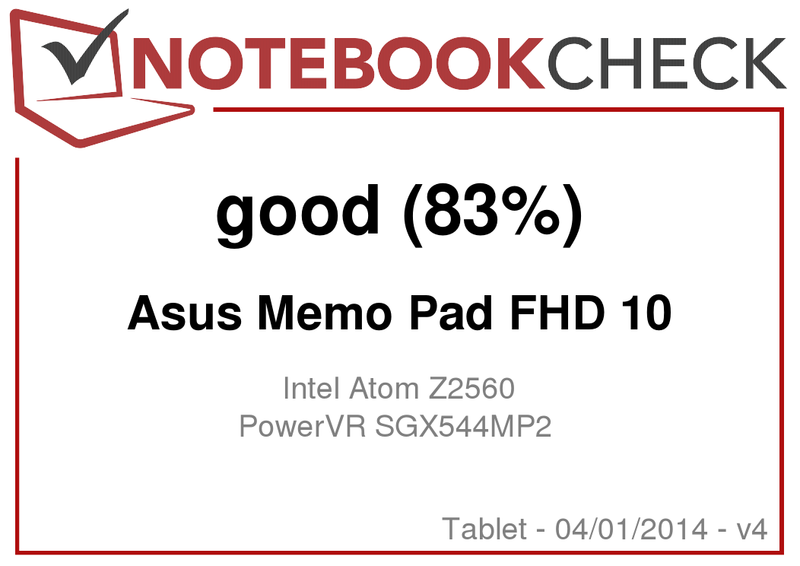 Asus' Memo Pad FHD 10 only lacks a bit of 3D performance for a price of just under 350 Euros (~$468). Particularly graphic-demanding game apps stutter along in view of the tablet's only middling graphics performance, excluding the benchmarks. The CPU is inconspicuous and even copes with most available apps. The x86 heredity under the hood is rarely noticed. The most striking feature of the FHD 10 is the name-giving screen with a resolution of 1920x1200 pixels. 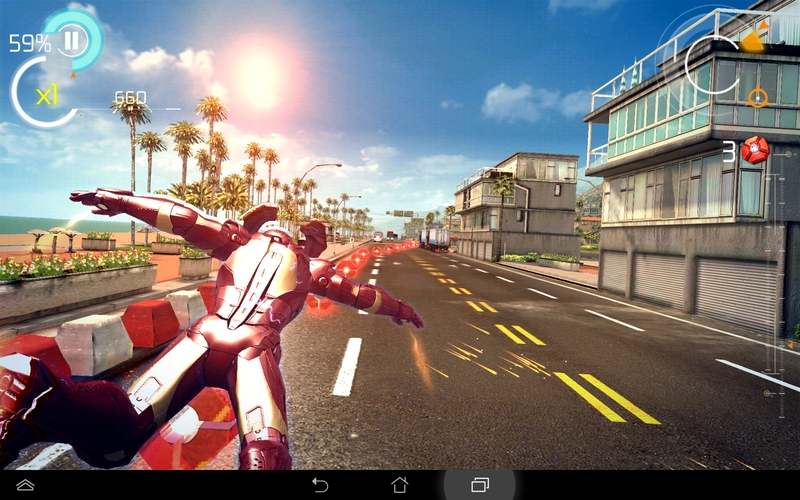 Thus, the tablet competes against the company’s own Transformer Infinity. However, the latter is more expensive due to its keyboard dock. Should a dock not be needed, the less expensive FHD 10 would be an alternative. The screen offers slightly dull colors and a minor bluish cast but is compelling in terms of viewing angle stability, resolution and brightness. The decent black value also pleases the eye in movies. The tablet's low temperature is also noteworthy. The device stays agreeably cool even during load and is very comfortable to hold owing to its ribbed back. Buyers with a larger tablet budget than 350 Euros (~$468) might find a better choice in Google's Nexus 10 that features an even higher screen resolution and a swift A15 processor. The more expensive Transformer Infinity could be an option for users who need a battery supported keyboard dock. Moreover, even the Retina iPad wants to win over customers with even more power and a better screen. The FHD 10 does not give reason for complaint and easily outdistances both Acer's Iconia Tab A700 and Huawei's MediaPad 10 FHD. 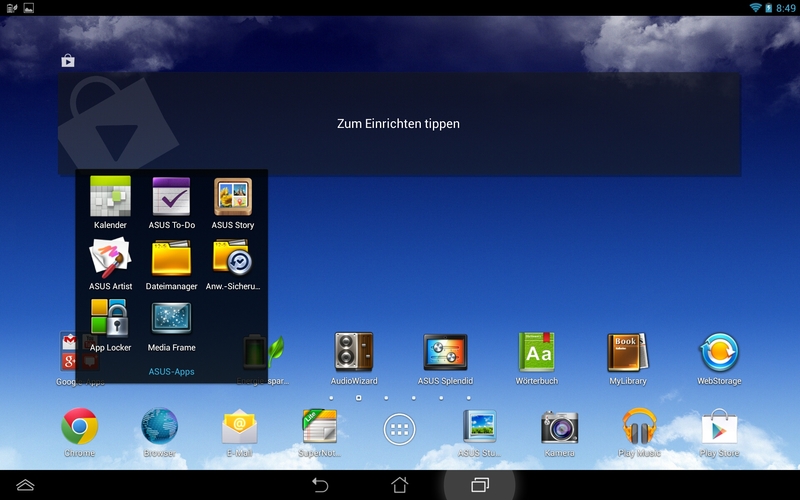 In Review: Asus Memo Pad FHD 10, courtesy of Asus Germany. The Memo Pad FHD 10 looks quite appealing. The tablet's ribbed back is convenient. The stereo speakers are on the sides. The 5 megapixel rear-facing camera does not shoot impressive pictures. We appreciated the brightness and high-resolution all the more. The build quality is also decent. Only the bezel is a bit wide. Portrait mode in the stand is a rather shaky matter. The stand was also included in the HD 7's box but also coped better with its smaller size. The box is small enough for an inconspicuous purchase at the electronics store. 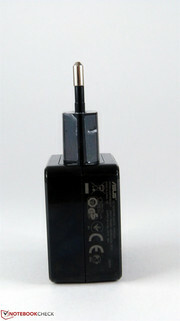 The included power adapter supplies 5 V with 2 A and features a USB port. A close-up of the port. The tablet is available with a white, pink or black backside. ...but bright sunlight is not really the stomping grounds of glossy screens. The tester admits: He has a slight crush on the key field with the number row. Android 4.2.2 runs in a only slightly modified version. 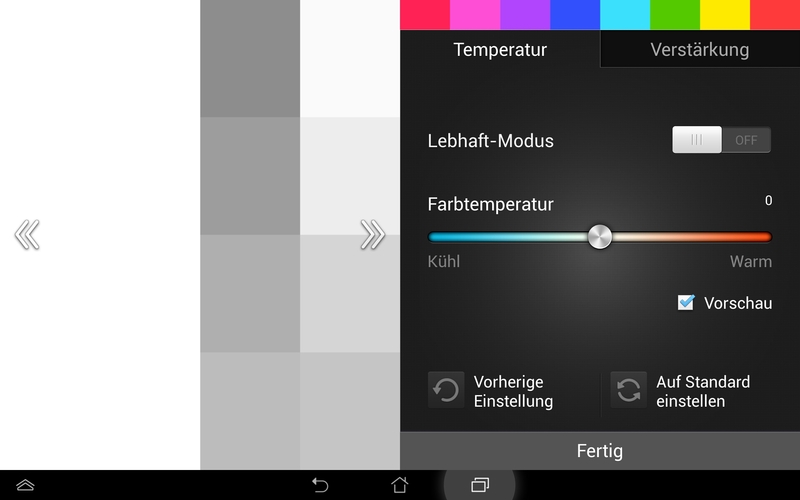 Asus' AudioWizard app changes the audio effects. Putting the tablet in the stand in portrait mode is not a good idea. It quickly topples over. 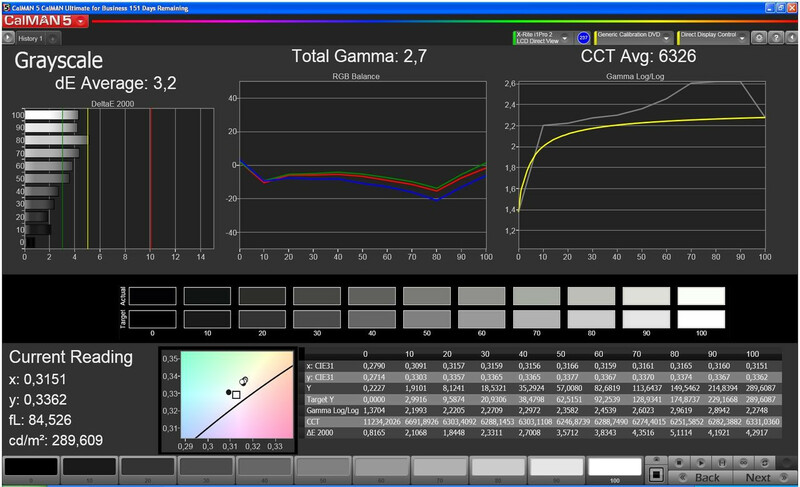 A color calibration tool is also included. Not too thick: Asus Memo Pad FHD 10. Micro-USB for recharging the battery and data transfer. CPU-Z lists four computing cores: 2 physical and 2 via Hyper Threading. 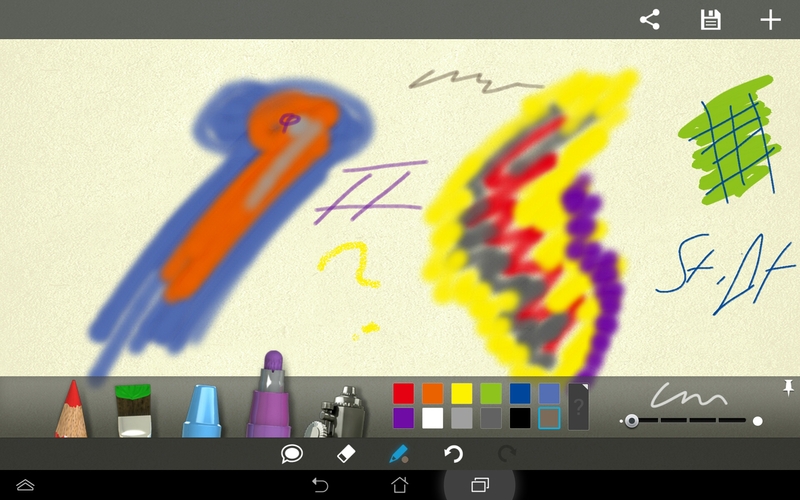 A nice gimmick that can be use to occupy the kids: The included paint app. HDMI is integrated in the space-saving version. The micro-SD neighbors it. The back has a pleasant feel and is slip-proof. But the screen also has to be praised because it displays an agreeably sharp image even from unfavorable angles. Apps that are more compatible with Intel hardware. The tablet sometimes stutters despite enough power. A slightly more stable stand would also be nice. Intel closes in fast and proves to have a performance competitor for the ARM platform with its Atom Z2560. Asus creates its own competition for the Transformer Pad Infinity with the Memo Pad FHD 10. However, the more expensive Infinity also allows connecting a keyboard dock with integrated battery. Acer's Iconia Tab A700 is now outdated and too slow. The faster Google Nexus 10 with a higher resolution screen and ARM A15 innards is a bit more expensive than the FHD 10.